Papers, your personal library of Science, and winner of the Apple Design Award for best Mac OS X scientific computing solution on the Mac, is now available for the iPad, iPhone and iPod touch. Papers puts your entire research literature database in your pocket, available at your fingertips wherever you go; whether you’re at a conference, in class, visiting your peers, on the couch or on the road. UPDATE | Papers for iPad now allows you to highlight and create notes on your PDFs!! Simply select the text by dragging your finger over the text (it works with multi-columns too!) and tap highlight, tap it again to change the color or copy the text. Or tap and hold for a second and add a note anywhere on the page. UPDATE | Papers now comes fully optimized for iOS4, supporting fast app switching as well as support for the high-resoluton retina display on iPhone4. Your research articles never before looked so good! OVERVIEW | Papers was redesigned from scratch to be a perfect and beautiful fit to both the iPad and the iPhone and iPod touch. Browse through the hundreds of articles in your library with the flick of a finger, lookup the papers written by a certain author or published in that well-known journal, organize your library in collections and add your rating or flag great works. Papers comes with a stunning PDF viewer built-in, especially on the iPad you never want to deal with normal print-outs anymore! And of course allows you to add your thoughts and notes to the articles you read, all at the spot, wherever you happen to be. But what if you forgot to add that one paper? Or you want to check out what’s new this week? Papers comes with 8 built-in search engines that give you access to millions of articles at any time: ACM, NASA-ADS, arXiv, Google Scholar, IEEE Xplore, JSTOR, Pubmed, and Web of Science. Search the world’s largest repositories, visit the publisher’s websites and even download new PDFs to your library and start reading straight away, it’s that simple. 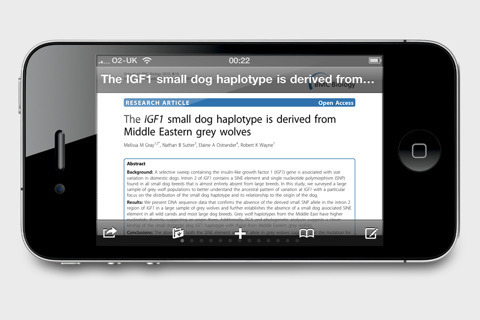 And you can even wirelessly exchange articles with other Papers for iOS users as well, or send an email to your friends and colleagues to tell them about your new findings and ideas. And last but not least, Papers of course synchronizes wirelessly with Papers on your Mac. But also if you use a PC or don’t use Papers on the Mac it works great as a stand-alone application as it lets you download PDFs straight from the publishers onto your iPad, iPhone or iPod touch. You can also upload PDFs through iTunes or import them from an email. With Papers, the world’s knowledge is never more than the flick of a finger away. Your personal library of Science, wherever you go. Visit our web site for a screencast to find out more! REQUIREMENTS | We recommend at least 100Mb of free space for storage of PDFs and article metadata. Use of built-in search engines and web browser functionality requires an active internet connection. Some search engines may require an institutional subscription. Syncing requires a wireless network connection and Papers for Mac (separate purchase). LIMITATIONS | Annotations are not yet contained in emailed or exported PDFs, nor synchronized to the Mac version of Papers. We are working on adding this ability in a next update of the program.